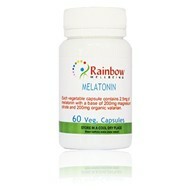 Melatonin is an endogenous neurohormone that is secretated by the pineal gland in the brain. The circadian rythm for the release of melatonin is closely synchronised with the habitual hours of sleep. In humans, melatonin secretion increases soon after the onset of darkness, peaks in the middle of the night and gradually falls during the second half of the night. In addition, melatonin secretion declines with advancing age. This effect of melatonin on the circadian sleep rythm pattern has led to the promotion of orally administered melatonin as a regulator of sleep cycles. Support for the idea came earlier this year with a study at the University of Granada in Spain, which found daily melatonin supplements kept mice young.